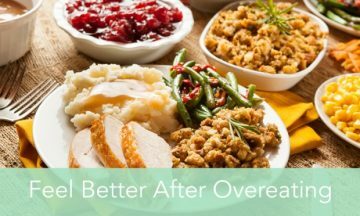 Overeating is a top health issue over the holiday season. The endless parties and family dinners bring the opportunity for food, food, and more food. The hors d’oeuvres, turkey, ham, and sides are all calling your name. While it is best to avoid overeating if you can, we all know that its easier said than done when mom is making all of her famous dishes. So, check out these tips we’ve compiled to help overcome that food coma. Nothing strenuous here, just a quick 10-15 minute walk to get your blood moving a little. A recent study shows that walking sped the rate that food moved through the digestive system. Walking can help to relieve overall intestinal pressure and therefore will reduce that uncomfortable bloating feeling. Walking also helps to get the blood flowing, which aids in the overall digestion process. Fresh air in itself can make you feel better too! Your stomach is on the left side of your body, and since the esophagus enters on the right, when you lie on your left the gas rises and can pass more easily. Chicory or Chamomile, specifically. They both are naturally caffeine-free and have a relaxing effect on both your mood and your digestive tract, which will make things move along their way. You may think that a glass of port wine or brandy with your dessert won’t make you feel any more full, but the sugars contained in the alcohol can be difficult to digest, particularly when combined with a large meal. Those digestifs can also make you feel more bloated and more gassy. A peppermint candy or some water with one drop of peppermint essential oil can help relieve the gas, indigestion, and nausea associated with overeating. However, if you suffer from heartburn or acid reflux you will want to avoid it since it relaxes the opening from the esophagus to the stomach allowing acid to flow upwards. Start drinking extra water before your meal, it will help you to feel fuller and will make you less likely to overeat to begin with. If you are also drinking alcohol during the holidays, this will help to stay hydrated as well. What are your favorite tips to feel better after overeating? Share with us in a comment below!